Sapphire Corporation is the best Hardware dealers in Chennai. We are also one of the proud stockists of Dorma XLC products. 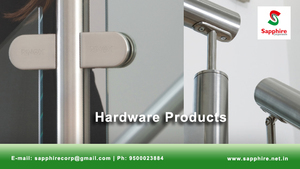 Dorma is a globally active supplier of door technology and systems. Rinox is India's largest exporter of Stainless Steel Architectural Hardware to European and American continents. The products are exported to more than 65 countries across the globe.